No space for an observatory? No space for a permanent pier? Is your equipment getting too heavy? Does it take too long to set up? Then the PORT-A-PIER is the idea solution! 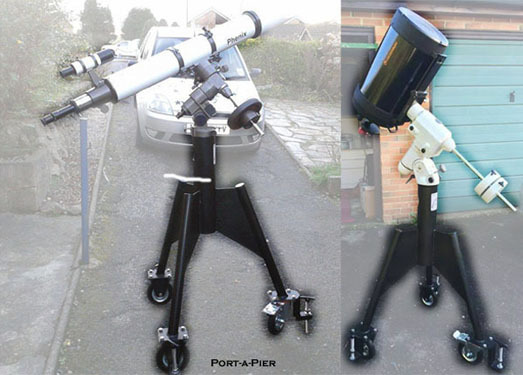 The PORT-A-PIER has been designed so that your telescope and mount can be permently left assembled and ready to use. It can be easily wheeled out of a garage or other building and can you can be set up and observing in minutes. No more time wasted carrying out your equipment and putting it away again. The PORT-A-PIER heavy mild steel pier on three sturdy wheels with HD stabilisers which are also used to level it.